Then the madness is over. It was a lot easier blogging while I was on vacation. It's almost appalling that employers expect you to work when you are at work. And yes that last sentence was sponsored by the letter S, as in S for sarcasm. I enjoy my job, I'm grateful for my job, but I just have been busy trying to catch up that I feel like that three-legged cat trying to bury his turd on that frozen pond. 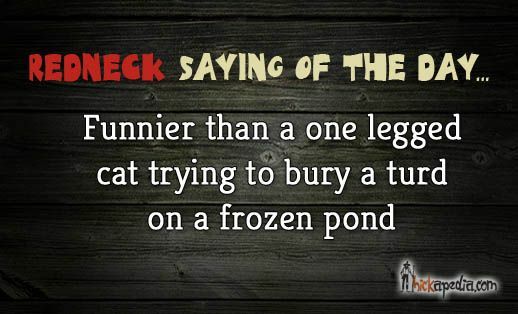 I'm not the smartest man on the block, but I'm thinking a one-legged cat isn't going to do much of anything and funny probably wouldn't be the first emotion I felt. Sorry if that sounds insensitive, but I do believe a one-legged animal would not be long for this world. 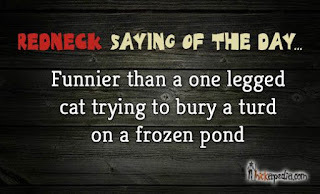 Anyway, just thought it was interesting, then rather amusing as it was the Redneck Saying Of The Day. I think the Redneck needs a fact checker. I can be really selfish at times. I'm busy too, but I think I have probably bored you to death with that fact this week. Anything new and exciting in your world? Well let's hear about it. We are gearing up for life with a 7-year-old. Two more sleeps and my little man will be 7. Almost got a little emotional typing that sentence. Isn't that something you have to say as a parent? I just love his smile and zest for life, and I'm glad to be his daddy. Wait 'til you're bragging about Kyle being 17! Ooops, sorry, didn't mean to depress you. Seriously though, every year gets better. We are now 30, 30, 30 (emergency back up daughter) and 30 (DIL) and 26. ak! 7 years! holy smokes, we were so much younger then we're older than that now. you'll be retired before you know it so don't wear yourself out at the cracker factory. Our boy is 35, and yes they grow up much too quickly. Try and enjoy every moment.